Students from the University of Notre Dame, Indiana University-Purdue University at Fort Wayne (IPFW) and Indiana University-Purdue University at Indianapolis (IUPUI) will gather on the gridiron in Stepan Center on the Notre Dame campus for the fifth annual mechatronic Blue and Gold football game at 7 p.m. April 19 (Friday). The event is free and open to the public. 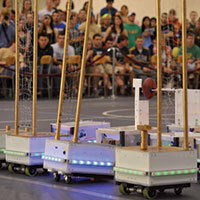 The event has grown from a classroom requirement into a robotic conference via the Mechatronic Football Club at Notre Dame and now features other universities, including IPFW, IUPUI and Ohio Northern University. In addition, the effort at Notre Dame has expanded from a senior capstone project to include undergraduate classes within the Department of Mechanical Engineering. Each team designs and builds robots — including linemen, running backs, wide receivers, quarterbacks and kickers — who compete for the Brian Hederman Memorial Robotic Competition Award. Hederman was a Notre Dame student who suffered an untimely death after his freshman year in 1995. The award and the competition itself were inspired by a drawing he left behind. Equipped with sensors that flash different colors when the mechatronic players are hit, tackled or injured, the robots are roughly the size of desktop printers. 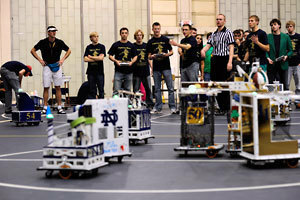 Every year the teams incorporate upgrades into their “players.” Among the achievements coming from these upgrades was the first completed football pass achieved by robots, which occurred in a game last year. During the most recent game between Notre Dame and Ohio Northern earlier this year, five passes were completed. The game itself consists of two 15-minute halves and a 10-minute halftime. The rules of the game are those for eight-man football, modified for mechanical play. Despite the air of a sporting event, the game is actually a display of the accumulated knowledge of sophisticated engineering concepts. The technical challenges of designing and building the robot football players deepen students’ understanding of and ability to implement engineering principles. The participants will use the skills they acquired during the project in their careers as engineers, applying the same principles to develop, among other things, intelligent prostheses, biomedical devices and electromechanical systems in general. After this weekend skirmish, the Mechatronic Football Club will travel to Atlanta in June to compete in the ASEE Atlanta Robotics Football Competition. Originally published by Nina Welding at news.nd.edu on April 12, 2013.